A press event held this morning, we had the great opportunity to meet the cast of the great series Power, Courtney A. Kemp (Creator/Executive Producer/Showrunner), Omari Hardwick (James ‘Ghost’ St. Patrick), Lela Loren (Angela Valdes), Naturi Naughton (Tasha St. Patrick) and Joseph Sikora (Tommy Egan) during a presentation following an Q and A . Power is a drama television series created and produced by Courtney A. Kemp. Which aired on the Starz network June 7, 2014. The series tells the story of James St. Patrick (Omari Hardwick), a ruthless drug-dealer under the nickname Ghost, who wishes to leave the criminal world in order to support his legitimate business interests as a nightclub owner. James aims to balance these two lives, while avoiding police capture, and looks to resolve his personal life as his marriage crumbles. This presentation was also a great place to learn more about the hit series Vida. The cast Tanya Saracho (Creator/Executive Producer/Showrunner), Melissa Barrera (Lyn), Mishel Prada (Emma), Ser Anzoategui (Eddy) and Chelsea Rendon (Marisol) all were present to talk about the importance of a this series Vida and why it has become a hit show. Not just in latin community, but world wide. Vida is an American drama television series based on the short story Pour Vida by Richard Villegas Jr. that premiered on May 6, 2018, on Starz. The series was created by Tanya Saracho, stars Melissa Barrera and Mishel Prada, and is executive produced by Marc Turtletaub, Peter Saraf, Robin Schwartz, and Stephanie Langhoff. On top of those amazing shows, two new shows were introduced. America to me and Warriors of Liberty City. America to me takes place in a high school were the series shows some of the struggles of young teens now. But from their perspective. It also shows the racial divide and how the community as a whole is affected. Warriors of Liberty City explores Liberty City (Miami, Florida). 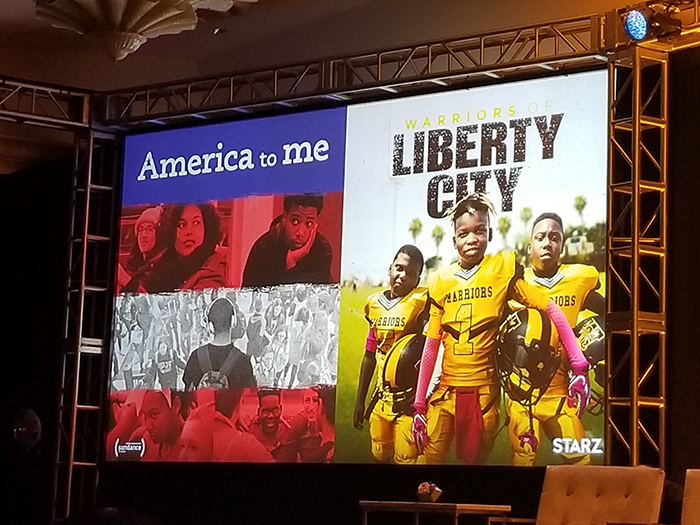 The series follows a season with the Liberty City Warriors, a youth football program founded by an unlikely mentor: Luther Campbell, better known as Uncle Luke from the 2 Live Crew. Even though kids and football are a controversial topic. Uncle Luke explains why his program is important to urban youth and how the program helps the parents too. Warriors of Liberty City will premiere on Sunday, Sept. 16, 2018, at 8 p.m. ET/PT. Here you can find our Uncle Luke interview that we did during this press event..
Based on Pour Vida by Richard Villegas Jr.